A beautiful picture book retelling of the fantastical story of Prince Caspian and his escape from his evil uncle's castle. A must for any Narnia fan. Caspian has been brought up by his evil uncle, the false king of Narnia, Miraz, and must now escape his evil clutches and trust in the old Narnia he has only heard about in fairy tales. 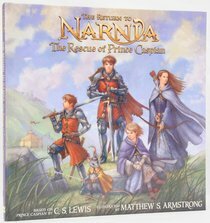 Can the royal children, Peter, Susan, Edmund and Lucy return to Narnia to aid the young and rightful king? About "The Return to Narnia: Rescue of Prince Caspian (#03 in Chronicles Of Narnia Series)"
Matthew Armstrong studied fine arts at the Visual Arts Institute in Sugarhouse, UT. He lives in Salt Lake City, Utah. All seven Narnia chronicles are here bound together in one spectacular top-quality gift edition with a personal introduction by Lewis's stepson, Douglas Gresham- Pauline Bayne's original drawings have been made even more memorable with the addition of colour. Order now to secure your copy when our stock arrives. Other edition is available. 0060765488 0 Available. Expected to ship in 5 to 6 weeks from Australia. Journey through the magical and mysterious world of Narnia with these classic fantasy novels from C S Lewis. Ages 10 +.